We hate to use the cliché, but in the case of some of Britain’s best loved comedians, they really are laughing all the way to the bank. In the 90s, comedy was called ‘the new rock and roll’, and from there into the modern day, shows moved from clubs, to arenas and then to stadiums as top acts like Newman and Baddiel sold out 12,000 seater arenas like Wembley Arena, Lee Evans sold out the O2 Arena at the drop of a hat, and Peter Kay broke the record for the most tickets ever sold to a stand up comedy show. 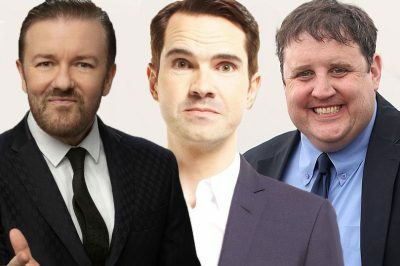 And that kind of gig certainly helps to line the pockets, especially with the likes of Gervais and Peter Kay, who, where the latter is concerned, has amassed a huge fortune of £28 million through his two companies in just one year from March to December of last year. And here, we’re going to have a look at the top earning comedy stars in Britain, and share some of the jokes that helped them get to the top…and rich! I think it would probably be quite fair to say that it wasn’t so much a case of comedy being Jack Whitehall’s last shot at making anything of himself in life (although it could be, I don’t know the guy), given that his father – the eminent former agent and producer Michael Whitehall –has already amassed quite a personal wealth himself, but even so, one has to commend Jack for making it on his own in a field that will eat you up and spit you out like you’re nothing. And Jack Whitehall has certainly made something of himself – kicking off his comedy career at an early age and becoming arguably one of the best British stand-up comedians, as well as comedic actors, of his generation – all before he’s 30. From starring in his own show Bad Education, as well as the subsequent movie, to the modern masterpiece that is Fresh Meat, and his Sky One show A League of their Own, Jack Whitehall has certainly earned some serious dollar in his young career, with an estimated personal worth of around £1.3 million. He currently resides in a £2.6 million apartment in Westbourne Grove, West London, which he purchased in 2012, with his girlfriend Gemma Chan – who also appeared in Fresh Meat. And usually, they say you can measure a comedian by their ability to deal with hecklers. If that is the case, then when a heckler at Warrington University shouted at Jack during a gig “I came here for comedy”, Jack’s reply of “no mate, you came here because you screwed up your A-levels” measures pretty high with me. Bristol native Russell Howard first burst onto the scene in 2006 when he started appearing as a guest on shows such as Mock the Week and Never Mind the Buzzcocks, and in 2007 he appeared on Live at the Apollo. His show Russell Howard’s Good News was voted the best show in the history of BBC Three to commemorate the show’s ten year anniversary (obviously this was before it was closed down because the BBC couldn’t afford to keep it on air, while still having enough money to keep BBC Parliament up and running for both of its viewers…naturally). Since then Russell, who lives in London with his medic girlfriend, has enjoyed sell-out tours and huge DVD sales, his Good Show is still one of the most regularly viewed shows on the iPlayer. He’s moved over to Sky One with a bit more of a high-budget version of that show now, and it seems as though there is no stopping Russell Howard from reinforcing his comedy empire. “When you’re three, you’re into custard and jumping” was one of his lines, and while it may not seem like much, it is a great line. He’s taken the torch from Billy Connelly to become the new king of Scottish comedy, and now Kevin Bridges has seen his brand grow to such where he is one of the most in-demand comedians in the country. His career in stand up comedy started with a bang, as he quickly took off after leaving school at the age of 16 and a year later trying stand up. His career on television began in 2008 on Comedy Central UK with The World Stands Up as well as televised appearances at The Comedy Store in London. This led to his big break on Michael McIntyre’s Comedy Roadshow, where his stand up performance was so critically acclaimed for his debut – which was seen by 5 million people – his entire 25-night run at the Edinburgh festival sold out in hours. He rose to the top quickly, and has been there ever since, as in 2012 he sold 45,000 tickets in one day as his tour stopped off in his hometown of Glasgow. His already handsome bank balance has been topped up nicely by hefty DVD sales, and before selling it for a profit of over £200,000, he lived in a £1.2 million seven-bedroom townhouse in Glasgow. Though she’d appeared in lauded TV shows such as Absolutely Fabulous and The Vicar of Dibley before her big break, her comedic turn in Lee Mack’s Not Going Out was the role that won her favour with the public, not to mention TV bosses. She impressed so much with her original small role as an acupuncturist, she was given a better and bigger role – Barbara the clumsy cleaner. It was a role in which she continued right up until her own show, Miranda, was commissioned in 2009, and that it when her star took off. Miranda – the show that is – has been a smash hit and as well as her four books, her live show – perhaps somewhat sardonically called My, What I Call, Live Show – and the DVD sales from it, her film debut in Paul Feig’s Spy AND Call the Midwife, it’s safe to say that Miranda Hart is, quite literally, running the show at the moment. And the 43-year-old has certainly treated herself with her earnings. She splashed £1.85 million on her home in Hammersmith, West London. One of the true heroes of Britain’s comedy boom in the 90s, Jack Dee has done it all in comedy – he’s one of the country’s most heralded stand up comedians – with Jack Whitehall citing him as his hero, he’s written Britain’s answer to Curb Your Enthusiasm, Lead Balloon, he’s written for other comedians including contemporary Lee Evans, and, among many other things, he was also a team captain on the second greatest panel show in the history of the universe, Shooting Stars. Though he’s had his ups and downs throughout his career, Jack Dee’s legacy in the British comedy game is matched only by a select few, and his influence is felt even behind the scenes, as his production company’s continue to produce shows such as Michael McIntyre’s Comedy Roadshow and Alan Carr: Chatty Man. So it’s probably no surprise that he’s certainly not short of a few quid, with an estimated personal worth of over £5 million. He calls a £4.25 million house in Wandsworth, South West London, his home, as well as a seaside retreat in West Sussex. Not bad for a guy that started as a waiter in the Ritz. One of his best lines, in my humble opinion, has to be: “My local pub is as rough as anything. I went to the pub quiz the other night…First question was, “What the f**k are you looking at?” Just amazing. John Bishop’s career is very much a tale of two halves (he’s also an avid football fan, so no pun intended), given that it wasn’t until he was in his late 30s that he first stepped on stage to do stand up comedy, as he performed for the first time in Manchester in October of 2000. He spent the majority of the 90s working for a pharmaceutical company, but his bravery to leave the security of 9-5 behind, to risk the financial security of his wife and children, to pursue a career in comedy only makes it all the more pleasing that he has succeeded, and then some. He became a professional comedian in 2006, and from there has become one of the most successful stand-ups in Britain today. Moreover, Bishop has also become a bit of a renascence man, with his stand up, charity work, interview shows, panel shows and writing. He made his fortune from many ventures, not the least of which was a huge sold out arena tour. And over the past decade, it turns out that the difficult decision to quit his job and risk it all in the world of stand up will probably be the best decision he will ever make, as he has amassed a fortune of £6.3 million, and currently lives in a £2.25 million ten-bedroom mansion deep in the heart of the ultra affluent rural Cheshire area. Jimmy Carr has hosted pretty much everything there is to host in Britain, and if he’s not doing that, he’s selling out arena after arena on tour after tour, with more than 1.5 million people being able to say that they’ve seen the modern day million-joke-man perform live. He’s not one to show away from a daring or risky joke, and often has the audiences hissing or gasping at some of his more, shall we say, choice material, but for those like myself who have a dark tinge to their humour, he’s one of the best. But he’s also had his share of off-stage controversy though, when it was discovered in 2012 that he had £3.3 million in a Jersey tax avoidance scheme. Nevertheless, his career in comedy has been a very fruitful one, and he boasts a personal wealth of £12 million, with one of the most palatial homes on this list – an Edwardian pad in Primrose Hill, North London, which he bought for £10 million back in 2010. He owns the record of the fasting selling debut stand-up DVD in 2008, and Michael McIntyre has only gone from strength to strength. His tours are ridiculously sold out, and always plays the biggest arenas in the country. In 2012, he was even reported to be the highest grossing comedian in the world. His comedy panel show appearances are numerous, but it wasn’t until the budding stand up was a guest on the former Jack Dee vehicle Live at the Apollo that his career really took off. After his appearance on Live at the Apollo, he performed for an estimated 500,000 people during his first tour of the UK, and has since toured three more shows that have sold an estimated 5 million DVDs. Though it was heavily taxed, Michael was reported in 2012 to have earned £21 million from a ten night stint of stand up shows in London. His brand of comedy may not be for everybody, but there’s no doubt that when it comes to success, he’s one of the biggest things going in this country. And he’s certainly splashing out with that wealth, owning two homes in Wilts and in Hampstead, London, respectively, with both at a combined worth of £5.5 million. My personal favourite story of Michael McIntyre actually comes from an anecdote told by Australian stand-up Jim Jefferies – who has conquered America in recent years and is seen today as one of the best stand-ups of his generation – who at one point lived in England and was a budding stand up on the circuit along with Michael McIntyre. A brazen cross between Lenny Bruce and Charles Bukowski, Jefferies certainly isn’t for the faint at heart, and after a particularly risqué joke one night at the comedy store, someone got on stage and punched him, at which point he retreated to the backstage area as the man in question was thrown out and arrested. In the words of Fatboy Slim, you’ve come a long way baby, and in the case of the working class kid from Bolton done good, truer words were never uttered. Or written in this case. He’s the master of his art, with the record for the most successful stand-up show ever going to his 2010-11 tour, as he played to over 1.2 million Brits. Astonishingly, he’s sold an estimated 10 million DVDs as well. He’s behind some of the best sitcoms in recent history as well, such as Phoenix Nights, Max and Paddy and Peter Kay’s Car Share, and amazingly, he still lives in Bolton – a true test of the man that, no matter how successful he becomes – never forgets his roots. But there are certain perks with being that successful, as when on his big tours, he splurges on a helicopter to get him back to his home in Bolton each night. Ricky Gervais is British comedy gift to the world. Love him or hate him, he has been the mastermind, along with comedy partner Stephen Merchant, of some of the greatest sitcoms ever made, and arguably THE greatest sitcom ever made in The Office. He changed the game, he really did. And though he’s been away from stand up for a long time, he’s coming back this year with what will no doubt be another gold-standard performance in the art of stand up comedy. His live shows have toured around the world, and he’s made millions from the distributions deals to over 80 countries for his magnum opus, The Office, and on top of that he is arguably the most famous Brit in American show business at the moment. And he certainly knows how to spend his cash. Gervais, who has built up a personal wealth of a staggering £55 million, and who didn’t get into comedy until he was almost 40, jets to and from London and New York between his £10.5 million Hampstead, North London home and his two flats in New York City. He also owns property in Marlow, Buckinghamshire. (I should note however, that although I may be gushing somewhat over Ricky Gervais, and I am a fan, I am trying to be objective. I just think he’s really good. If you want my opinion on the funniest man in the world right now, the best stand up as we speak? You can’t look any farther than Greg Davies. Yes, I mean that with all my heart. His best comedic moment ever, in my opinion, is not a joke or a witty line, it’s a simple moment of physical comedy. In The Office, when he is asked by a bald employee if they’re going to lose their jobs (after he’s made a lot of bald jokes of course) he pensively lets his hand rest on the guy’s head as he thinks for an answer. No words can do it justice. It might just be me, because I’m so immature, but it might be the funniest thing Gervais has ever done.